Hello to All....hopefully someone can help me! 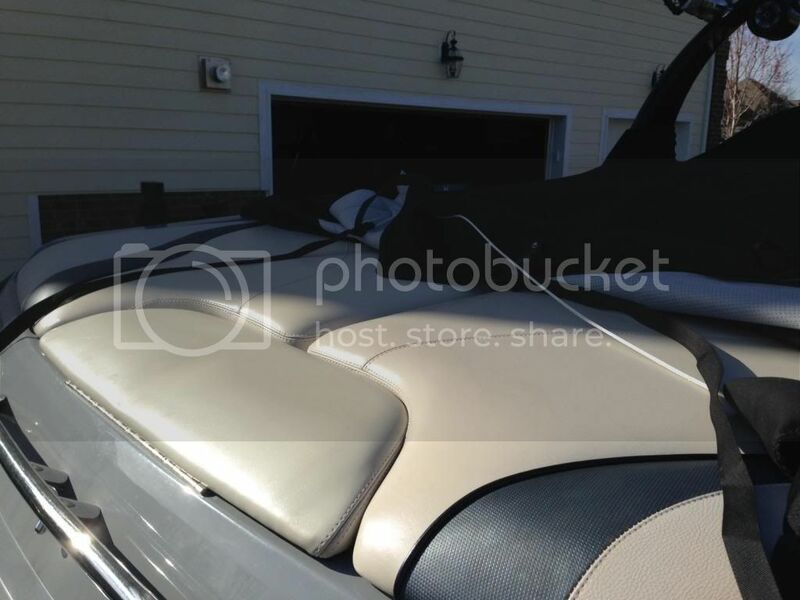 Put cover (commercial sewing black) on boat for 3 days in my driveway while my lift is being installed. Came home from work lady night and took cover off and hatches are an awful reddish pink hue. With that said, before I put cover on my vinyl was PERFECT no dirt, moisture, stains or any problems. I have read the few posts on here concerning this but I am sick to my stomach about the idea of nit being able to cover. I want to be able to cover while on my lift to protect against the dirt daubers, spiders etc. anyone have any suggestions? I have attached photo.....thanks everyone for any suggestions! If you remove the cover and leave the boat in the sun for a few hours, the discolouration will go. From what I can fathom, the upholstery will always contain some moisture & with the heat near the cover in the sun, creates some sort of mould or bacteria resulting in the discolouration. As long as your lift has a secondary cover, a roof, the black cover will work well to keep the dust off. May need to consider some side curtains to keep the sun from the sides. 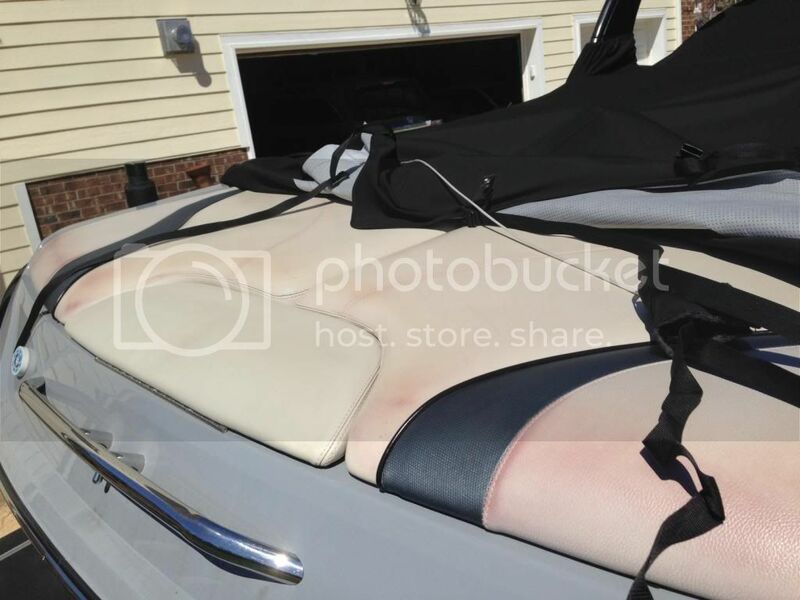 Had the same situation of the discolouration on a recent 14 hr road trip in some 40 deg C heat, over 100 F.
Only discoloured where upholstery came in contact with the cover & up to 4" away from the cover, again, must be heat related. I just realized that my photo didn't upload...so here it is. For the life of me I don't understand with Factory vinyl in perfect condition and a Factory cover how this can happen. THe boat was covered for 3 days only and was SPOTLESS and BONE DRY when I covered! From reading other posts it seems that it is something to do with the adhesive that Malibu used in the foam and vinyl construction? I wonder If i went with a lighter color such as Tan cover if this would still happen? I noticed it around 6;30 last night and at 8:30 this morning no change its still there...boat was left uncovered all night. Obvisouly sun has not had that much time to cook it but hopefully today! Has anyoine had this happened in direct sun with no cover or is it only when cover is on?? From what I read Malibu does not want to take any responsibility for faulty or defective vinyl so I am left fuming and bewildered and what to do. DOes it happen on 2014 boats or was it just 2010 and back boats?? Man I hate this!!! Thanks for replies! Let it sit in the sun. Don't use that cover again. I am wondering if I switch to a Evolution cover or similar if it will do the same thing? It aint right but that's normal. I'm thinking about rigging up a contraption using noodles and straps that I can toss over the transom edge to keep the cover from directly contacting the vinyl. A good sun bake will bleach it completely away...till the next time. The noodles work great Ndawg. I've been doing that trick since I picked up my VLX. Just something to get a little air between the cover and vinyl. Water still drains off too. The issue I'm running into is that my driveway slopes down towards the bow so I'm all ready fighting pooling because I can't get the bow up high enough. I fear the noodles will create an even bigger potential for pooling right over the starboard side corner seat. You're right, it will. I have the same issue and have to park in exactly the right spot for it to work. not sure here...is it the vinyl, the cover, or just the fact they touch that creates this? So from what I gather no matter what cover you use or no matter what color the cover is it is going to happen unless you get you get air flowing through! I wonder how you could handle the back rests or side cushions in the bow My bow sides had a little of it as well. I cant tell you how sick I felt when I pulled the cover off for first time...I just got the boat a week ago today and was stoked at how well it was taken care of...there is not a scratch on the whole boat and everything it just as nice as brand new...until I take cover off! I seriously thought I was going to throw up! I woke up at least 10 times last night just ticked off at the world!!! If it is a black Evolution cover it will do the same. They recommended that I do a charcoal as the darkest choice. Malibu only offers a tan cover now because of this issue. So a light colored cover and it won't happen anymore? I dont care about spiders and dirt daubers staining a tan cover if it will keep my cushions from looking like they are 50 years old! That is just sickening!! Anybody know what years are affected? It is a product of heat. A black or dark cover baking the glue in the vinyl. I light color shouldn't get as hot. The last thing I want to do is bring a bad name to Evolution Covers, Cory and his covers are great, anyone who has spent time on here knows that. But the pics I posted are with an Evolution cover. I've spoken with Cory about this issue. Without getting into the science of why this happens, I'll simply say that a lighter colored cover won't matter much. The heat difference is marginal, my grey carpets were impossible to walk on last weekend when I opened up the boat, it still gets hot!! The key is air flow. Wow...so everytime I want to take the boat out I need to get up 2-3 hours before and take the cover off and take boat off lift and move to outside of the dock and place in sun......what a pain in the you know what!!! Malibu should be ashamed of this and if it is happening to as many people as it seems you think they would own up to their defects! In the grand scheme of things it would not be that drastic to fix the defect. If you think about it they really would only have to replace sundeck and bolsters in the bow because it seems there is enough airflow elsewhere???? NDawg...when you use your noodle contraption do you still get any at all?? And are you just basically laying noodles the direction of the boat on the sun deck? I have never had this issue. I knew it could happen so I have always put noodles under the cover on the rear hatches. Nothing real difficult just place them where some air can circulate and water will still run off. 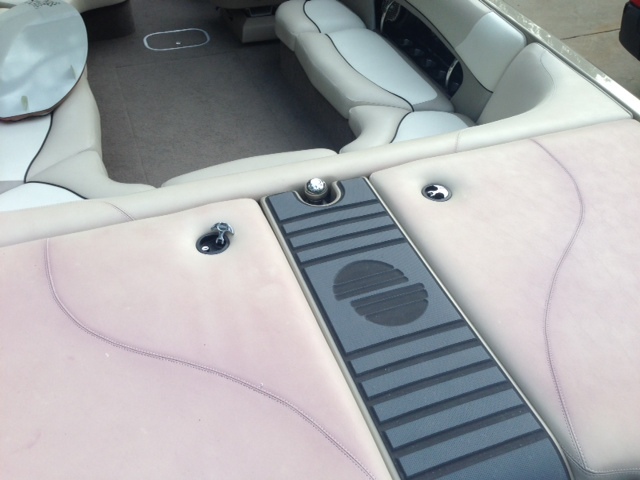 Agreed, I'm on my second boat dealing with this issue, so I can tell you it dates back to at least 2006 models. I had good results when I tested it but not completely eliminated, I think I need 4 instead of the 2 I used. I lay white towels on the back of mine under the cover....works. Dates back to the 2000 vlx too. Mine did it. Noodles work great. Black cover/ Heat is your problem with no air circulation. Youll find that putting some barrier between the cover and vinyl will help a lot. There was recently another thread started on this, http://www.themalibucrew.com/forums/index.php?/topic/49063-bad-vinyl-glue-mold-whatever-it-is/ . Very common unfortunately. get your cover dry cleaned. happened to my boat once and I got the cover dry cleaned never happened again. also the sun will get rid of it..
purple on white vinyl, and just a darker splotchy tint on some blue vinyl trim. to the new vinyl (hasn't happened yet), but I'm still using the same black cover.